With a cooked spaghetti squash you can make this shrimp & basil spaghetti squash dinner in only 15 minutes! 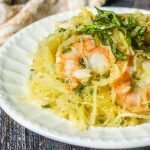 The garlicky basil shrimp add so much flavor to the spaghetti squash and it's only 6.6g net carbs! In a large saute pan, add the oil and garlic. Saute a minute until fragrant. Add in the shrimp and saute for about 5 minutes until pink. Add in the basil and stir for 1 minute to coat the shrimp. Next add in your butter and then the squash. Cook for another minute or two and you are done.